There’s nothing quite as luxurious as a home steam facial. Between the steam itself and the added scents, it’s the ultimate in relaxing. 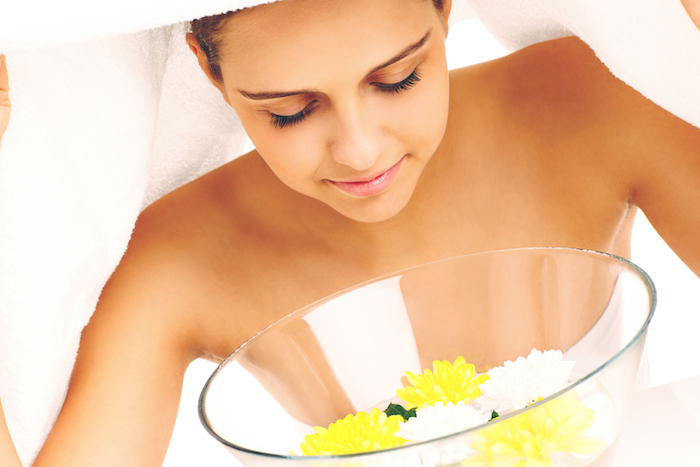 Beyond that, facial steams can also enhance circulation and opens pores for cleansing. The theory is that it makes your face sweat a little, allowing the pores to open and your face to naturally purge whatever’s in the pores. Below are some of the top ways to do a home steam facial. This is one of the most popular methods, as it’s inexpensive and gets the greatest amount of steam going. To do this method, start by washing your face. You’ll need to make sure your face is completely clean for the maximum benefits of open pores. Then bring a few cups of water to a boil on the stove or in the microwave. Add that water to a glass or ceramic bowl. This is the fun part where you get to customize the properties of your facial. Add either fresh herbs or essential oils to your boiling water based on how you want the facial to feel. For instance, use lavender for relaxing, peppermint for energizing qualities or eucalyptus to open up the sinuses. Place your head over the bowl of water, and drape a towel over your head and the bowl to trap the steam. Stay like that for about 10 minutes. This is the part where you make the most of your newly open pores. Do a facemask to pull out impurities, like a bentonite clay or raw honey mask. You might also consider exfoliating, or any other treatment that helps cleanse the pores. Finish with a toner to close pores back up and then use a moisturizer. If you want a more ready-made option, there are plenty of facial steamers on the market. These are made to blast just the right about of steam at your face for a specified time. Some, like the Panasonic EH-SA31VP Spa-Quality Facial Steamer, advertise that they generate nano-sized steam particles that better penetrate and moisturize skin. For a quick and easy shortcut, there’s also a method for using hot towels. Basically, you just submerge a face towel into some hot water. Make sure it’s cool enough to keep on skin without pain, and then drape it over your face for five to 10 minutes. If you’re short on time and need to kill two birds with one stone, you can also get some of the benefits of a facial steam right in the shower. Turn your water up to a hot temperature so that it will cause visible steam. Then stand in the steam generated by the shower so the brunt of the steam is hitting your face. Stay like that for about five minutes. Then turn the water temperature down and continue your shower.